June was a busy month for the Roundtable. June 17-28 found 25 Roundtable members examining three different educational environments, those of Finland, France, and England. Built around a meeting with OECD officials to discuss international assessment results for 15-year-olds according to the Program for International Student Assessment (PISA), this study mission looked at schools in Finland (where schools and teachers are given a great deal of freedom to develop instructional programs to achieve national goals and large-scale assessment is almost unknown), France (traditionally the very model of a top-down approach to educational administration) and England (which is experimenting with “academies” and “free schools,” very similar to what Americans think of as charter schools. Mark Sherringham (Cultural Attache, Embassy of France, Washington, DC), Cynthia Davies (British Ministry of Education), and Helena Lalu-Toivio and Pasi Stahlberg (Finnish Ministry of Education) assisted the Roundtable in scheduling meetings and school visits. We are greatly in their debt. 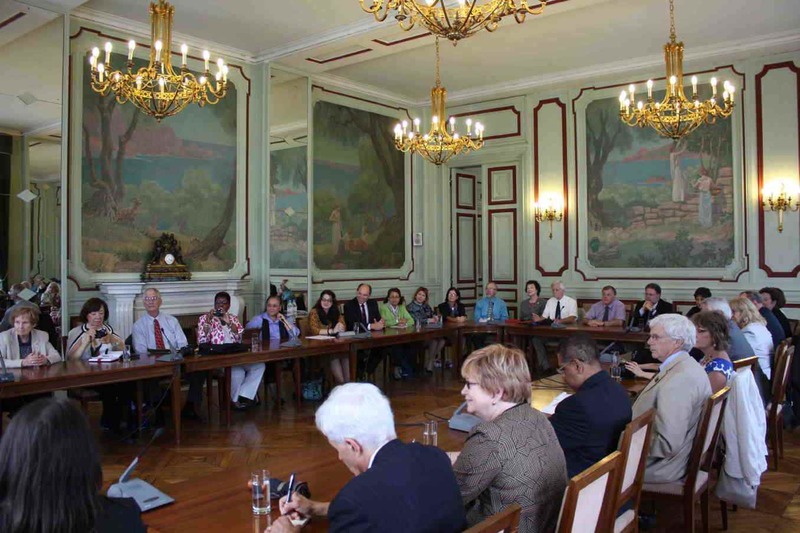 The Roundtable’s progress in Europe was documented in a blog, The Roundtable Abroad. Below we list some of the highlights of the visit to the three nations. Separate entries are devoted to Finland, France, England, and the Program on International Student Assessment (PISA). 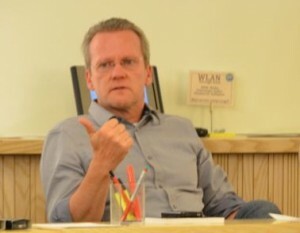 President Obama and Arne Duncan will not improve “education with what they are doing now,” asserted Pasi Sahlberg, the Finnish ministry official responsible for international education cooperation. English officials have “data to die for. We know everything.” They know what each child has taken and how well they are doing. They have also privatized half the secondary schools in England in the last decade. French schools are driven by directives from the center, but Finnish schools rely on “gentle steering based on local trust.” Finnish teacher preparation programs receive 7,000 applicants annually for 900 places in a 5-year training program. About 22% of American children live in homes with incomes below 50% of the national median, compared to 16% in Britain, 7% in France, and 3% in Finland. 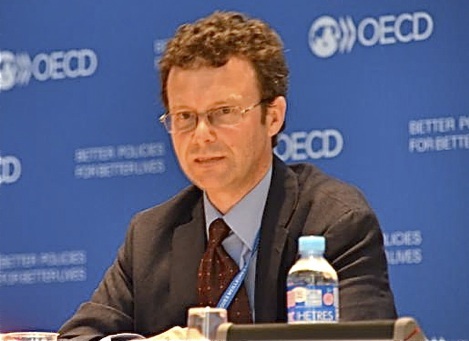 Although the Organization for Economic Cooperation and Development (OECD) describes Shanghai as a system that is both highly effective and equitable, that characterization seems to ignore data indicating Shanghai discriminates against hundreds of thousands of low-income children in the city. These were among the most significant insights of an 11-day Roundtable study mission to examine European schools. For all of its beauty in the summer, Finland can be brutal during the winter. The Lapland area of the country is located within the Arctic Circle and long, dark winter days throughout Finland mean that Finns take special pleasure in their summers. A sense of national liberation prevails around the June equinox as schools close for three months and most government agencies operate at half staff for six to eight weeks. The Finnish education system consists of daycare programs (for babies and toddlers); a one-year “pre-school” (or kindergarten) for six-year olds; a nine-year compulsory basic comprehensive school (starting at age seven and ending at the age of sixteen); and optional secondary general academic and vocational education (which just about everyone takes). Both the academic and vocational tracks usually take three years, Petra Packalen, counselor to the education ministry, told the Roundtable. The Education Index, published as part of the UN’s Human Development Index in 2008, lists Finland as tied for first place with Denmark, Australia, and New Zealand. Mean results from PISA also rank Finland at the top of Western nations in achievement, although the same results indicate it produces just 1% of the top 15-year-old science students in the world, a standard by which the United States, producing 25%, leads the world. Dismissing PISA league tables as “irrelevant” since they ignored equity, on which the United States performs well, according to Sahlberg, he focused on three big issues. Not always high-performing. 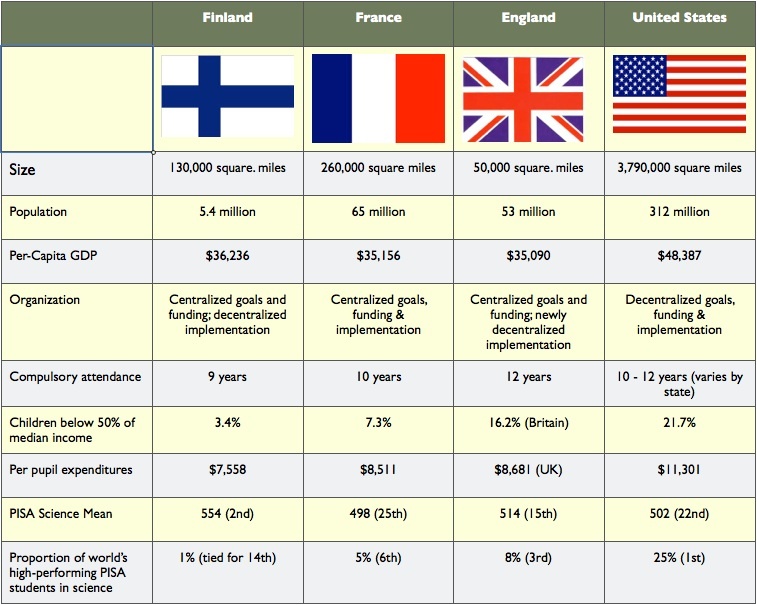 Finland has not always been a high-performing system, noted Sahlberg. Forty years ago when Finland set out to improve, it lagged badly with child poverty rates in excess of 20 percent. ”You can’t educate a hungry or unhealthy child,” he said. So Finland pushed for free school meals everywhere and compulsory annual health checks, as part of a dual strategy promoting equity within schools and equity within society. “We walked our own way,” said Sahlberg. He argued forcefully that while the U.S. embraced competition, standards, choice, and accountability, Finland chose cooperation, individualization, equity, and trust in educators. A major part of the Finnish agenda was attacking the out-of-school dimensions of student achievement, especially family poverty. Finland: high-performing in many ways. Finland is not a socialist state, emphasized Sahlberg. “It has married the market ideal to the welfare state.” Finland is very competitive globally; it is known for technology, innovation, gender equity, and great integrity in public administration. Finnish national policy emphasizes quality, efficiency, equity, and internationalism. A basic right to “education and culture” is embedded in the Finnish constitution. Because public authorities “must” secure equal opportunities for every resident, “When I moved it never occurred to me to worry about the quality of my children’s new schools,” said Tornberg. About 13% of the national budget is devoted to the national Ministry of Education, which funds about 40% of educational costs. 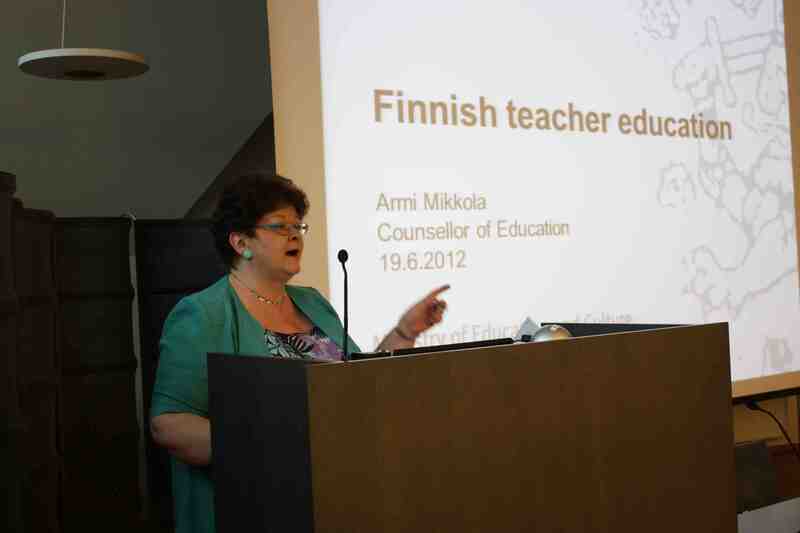 Tuition at Finnish universities is free and teacher education is one of the highly desirable courses of study. Universities select the best of the best for teaching. They typically have 7,000 applicants for 900 places and select students based on grades, examinations, and interviews. Professional development funding has doubled since 2009, reported Hamalainen. Trust and respect for teachers explains the popularity of the profession, according to Mikkola. Subject matter teachers are paid better than nurses. A five-year training program provides a lifetime certificate that does not need to be renewed. All teachers (from kindergarten through university) belong to a single union which is “one of our most important partners” in developing national policy. Accountability is based on trust and professionalism, according to Packalen. The national model is one of “gentle steering built on the principle of trust,” she said. The focus is on learning, not testing. Inspection, national tests, or ranking of schools based on tests do not exist in Finland. Local schools are able to spend funds just about any way they want, with teachers and principals trusted to meet the needs of their students. Ernest Boyer, U.S. Commissioner of Education until 1980, liked to tell a story about French education to make a point about local control in American schools. “How do you know what your students are studying?” asked an American visitor of the French Minister of Education. The minister consulted his watch: “It is 10:37. At this minute, every 14-year-old in France is opening the Algebra book to page 43,” he declared. While that degree of control is not the norm today, it is still true that the French education system is far more centralized than that of the United States. 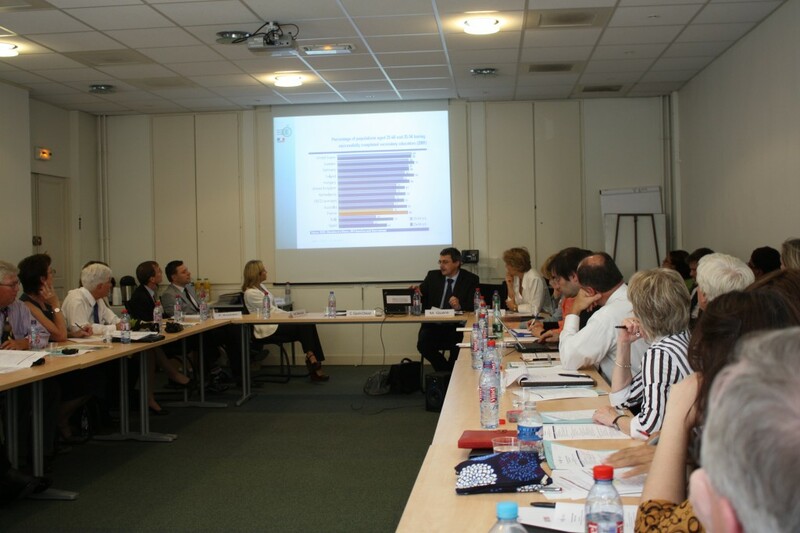 The Ministry of Education defines the educational program, which is carried out by 30 “académies” throughout France, roughly similar to state governments. Every one of the 1.2 million teachers in France is a civil servant, an employee of the government of France. Education is compulsory in France from the ages of 6 to 16, but a large majority of children start school well before the minimum age, often as young as two years old. Over 50% of 18-21 year olds in France are still in full-time education or following a vocational training course. Some 64% of all school pupils in France complete their secondary education and take the high-school leaving certificate examinations, known as the baccalauréat or the baccalauréat professional. Private schools: About 20% of French students are in private schools — almost five times the U.S. rate. About 90% of these schools are Catholic; they select their own teachers and offer religious instruction, but follow the same curriculum as state schools if they wish to receive state support and remain under contract to the state education system. The French system has been highly centralized since the time of Napoleon. Every teacher is a civil servant and teachers represent at least 60% of all government employees. 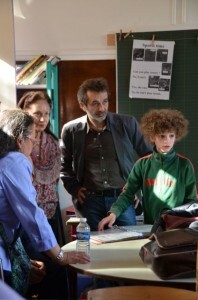 Académie inspectors worry about schools at the elementary level, but subjects at the secondary level. Inspectors believe their jobs are getting tougher, as social challenges mount in and around cities and adolescent behavior becomes more challenging. Teachers are paid by the national government, capital expenditures by localities. Paris holds 180,000 K-12 students but 350,000 university students — since the city is France’s center of higher education. Teacher preparation in France is a five-year program. Vocational programs do not enjoy the support among policymakers that they once did. The French have always been so proud of their language and culture that it has proven difficult at times to persuade students to take a foreign language. Ministry officials consider PISA to be significant, but something that provides an image of the past. Still, ministry officials worry about the fact that about 20% of French students are not doing well on PISA’s math assessment. France is cautiously piloting devolution and decentralization approaches, along with efforts to apply performance assessment to public policies (but not personnel). French educators are eager to encourage exchange relationships with schools in the United States to promote international cooperation and mobility. While it has made a great deal of progress, England is still struggling with the educational legacy of centuries of class division, within both society and schools. Full-time education has been compulsory for all children aged between 5 and 16 for some time; the school-leaving age was raised to 18 in 2008, to take effect in 2013 for 16-year-olds and 2015 for 17-year-olds. The English system displays many of the characteristics of the American reform movement — assessment, accountability, and the establishment of charter-like schools, variously called academies, trust schools, or free schools. 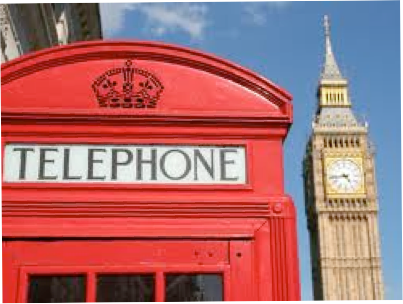 The English system emphasizes tests at the age of 7, 11, 14, then a General Certificate examination at age 16, and “A” levels for university admission at age 18. After “15 years of aggressive management, the new government is aggressive about deregulation,” said Hackman. It will emphasize more accountability, a slimmer, more traditional curriculum, and reduction of central administrative costs. 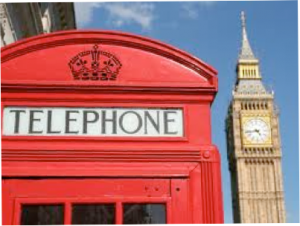 England is launching an effort to add a year to teacher training programs, reported David Wright. A university degree in England typically takes three years; the emerging proposal is to add an additional year to teacher-training programs, with one term devoted to theory, a second to classroom practice, and a third revisiting theory. In the last decade, 50% of all secondary schools in England have become privatized as either academies, trust schools or “free” schools — i.e., free of government regulation. The Secretary of Education is on public record as favoring free schools run for profit and staffed by teachers without certificates. The impetus for deregulation, said Hackman, is that national strategies produce fairly rapid improvement for 10 years, but then flatline. She thought this to be true across the British Commonwealth, not just in England. Ongoing issues, according to Hackman, include: challenges of the rural and urban poor, bullying and racism, inattention to vocational education, and the need to integrate the welfare and education agendas. Meanwhile, the new government is pursuing policies to require phonics as the basis for reading instruction while equalizing expenditures per low-income student, according to analysts Victoria Woodcock and Nicola Ayton, in a process that will almost certainly take money out of high-poverty urban schools for redistribution to suburban and rural areas. Visits to two schools dramatically highlighted the different challenges facing schools educating the children of the poor (Bonner Primary) and those of the privileged (The Harrow School). Bonner Primary: Addressing adversity. Bonner Primary in Tower Hamlets, London, enrolls the children of refugees and emigrants from Bangladesh (where 50% of the population lives on a dollar a day or less). Their families live 10-12 per two-room apartment in nearby public housing estates. The school is internationally known for its remarkable success with this very challenging student population. “This community,” said headmaster Martin Tune, “has more child poverty than any other area in England.” Fully 90% of the children are Muslim, reported Tune. Bonner Primary has succeeded in raising 50% of its students to Level 5 on national standards by age 11, a standard normally sought by age 14, said Tune. Tune described a powerfully successful multi-year effort that concentrated first on raising literacy levels, turned next to mathematics, and finally broadened the curriculum to include an emphasis on arts for all. Tune stressed that instruction is individualized, that the school supports what each student needs while assiduously avoiding labeling students as special needs, and that it builds community within the school and in the surrounding neighborhood so that parents and community leaders support high expectations for students. The school is oversubscribed. It had 450 applicants for 60 spots in 2011 and gives priority to special needs children, siblings, neighborhood residents, and then applicants at a distance. Staff turnover is low and last year Tune had 350 applicants for three teaching vacancies. Every teacher teaches only 90% of the time students are in class; 10% of their time is reserved for planning, grading, and evaluation. The Harrow School: privilege and high expectations. 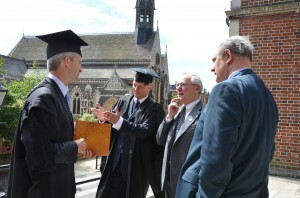 Harrow is widely considered to be one of the finest secondary schools in the world. 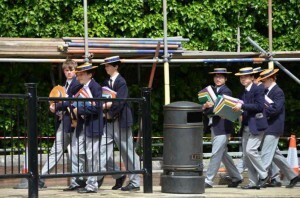 Like its rival Eton, it is an independent boarding school for boys. 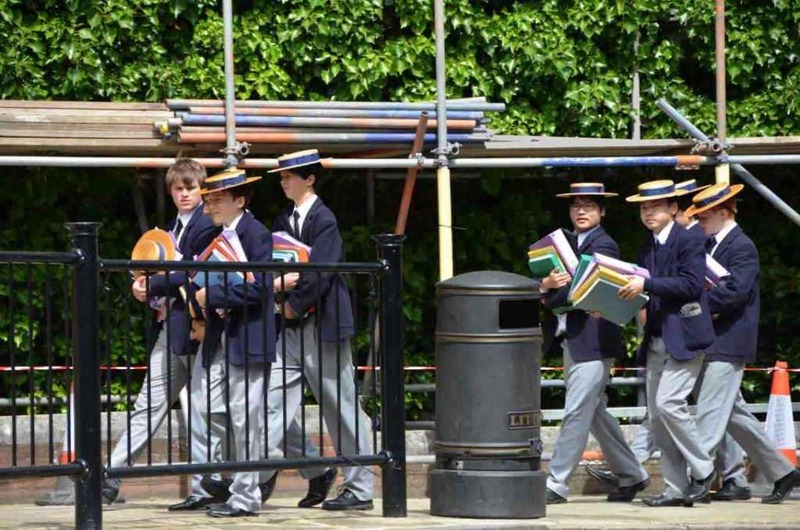 Founded under a royal charter from Elizabeth I in 1572, Harrow enrolls 800-900 boys, all of whom board full time. Graduates are known as “Old Harrovians.” Basic costs at Harrow run to approximately $50,000 annually for room, board, and tuition. It enrolls students who are highly privileged and very ambitious, although a bursary (scholarship) program funds the enrollment of exceptional students from distressed backgrounds. Harrow has a rich history and tradition. The school’s line of famous graduates includes Winston Churchill and six other prime ministers as well as foreign statesmen, Members of Parliament, and several kings and members of various royal families, according to headmaster Jim Hawkins, who greeted the Roundtable. Old Harrovians also include notable figures in the arts and sciences, including George Lord Byron, the Romantic poet and hero who swam the Hellespont and wrote “Childe Harold’s Pilgrimage” and “Don Juan,” while starring himself in the latter role. Scrupulous attention to admission and selectivity, which begins two years before enrollment, with students and families required to visit Harrow for examinations and interviews, wherever they live in the world. An emphasis on community, the Harrow “family,” and the value of “houses” — the dorms in which students find their identity, often through athletic and academic competition. Housemasters in the 12 houses help students manage the academic stress and their time. A rigorous academic program that requires, for example, every student to take a year of Latin and at least one other foreign language. Small class sizes to encourage individualization: Classes are normally limited to 15 students. More advanced classes (say, a third year in a language) typically enroll seven or eight students. Despite obvious differences, common elements link the two schools. Repeating a theme heard at Bonner Primary (and Saarnilaakso), Jesse Elzinga, director of studies, noted that a culture of high expectations, individualized instruction, and a sense of community are central to the Harrow experience. Barnfield Studio School: privatizing public education. 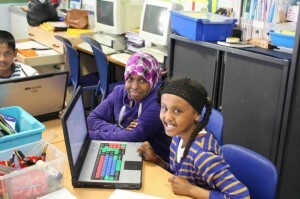 The prior Labour government under Tony Blair was interested in “injecting the DNA of business” into public schools, reported Peter Birkett, founder of the Barnfield Federation, which operates and manages the Barnfield Studio School, a secondary school emphasizing entrepreneurial education and vocational preparation for 14 to 18-year-olds. The new coalition government, led by the Conservative Party, is even more enthusiastically on board with a privatization agenda. Over half of all secondary schools in England are now “trust” schools (funded in part by corporate donations) or “academies” (financed by the government through charitable organizations). The new government has added a new category of “free” schools, denoting “free to attend” and “free of regulation.” Secretary of State for Education Michael Gove has blessed concepts of operating these schools for profit, of permitting teachers without credentials to teach in them, and of selling off school playing fields — conceivably for 2,000 academies. With the exception of selling some playing fields, these are ideas to date, not settled policy. Birkett, an engineer whose career had been built in Australia, was happy to participate in the Blair effort, launching the Barnfield Federation as a sort of holding pen for a variety of schools. He was recognized for his efforts by the new coalition government shortly before the Roundtable arrived in London, being named to the Queen’s Honors List by Prime Minister David Cameron. Plain Pete Birkett is now Sir Peter Birkett. 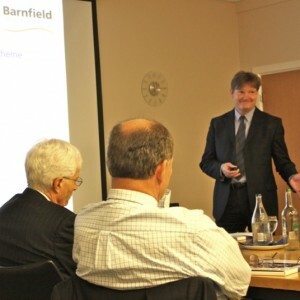 In a compelling presentation, Birkett (left) argued that the great thing about federations such as Barnfield is that they “are able to be independent, even though 80% of the income for our schools comes from the government.” Barnfield was the first federation to be an academy sponsor and to establish a free school. It operates seven campuses, employs a staff of 1,700, and has an annual operating budget of about $65 million, with “healthy reserves.” Birkett believes the Federation is able to drive more dollars to the classroom by restraining administrative costs at the center. The Federation enrolls 26,000 students and plans on 40 academies — the “sweet spot” in terms of the Federation’s finances. 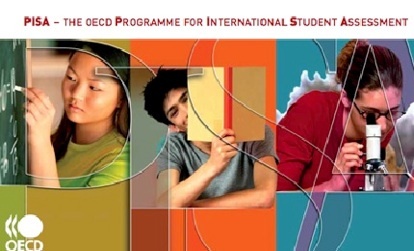 When the Organization for Economic Cooperation and Development (OECD) issues the results of the Program on International Student Assessment (PISA), education ministries around the world fret about the relative performance of their 15-year-olds. While American corporate and political leaders complain that average American student scores “rank” Americans 22nd in the world in science, European leaders often worry that America will overrun them in global competition since American schools produce 25% of all high-scoring 15-year-old science students in the world. By that standard, the United States ranks first in the world. Japan, which produces 13% of all the high-achieving science 15-year-olds, is second. While in Paris, the Roundtable had the benefit of a detailed briefing on PISA from Michael Davidson (right) of the early childhood and schools division of the OECD education directorate. The assessment involves more than 500,000 students, representing 28 million 15-year-olds in 74 nations. It covers reading, mathematics, and science. In reading and math, the U.S. is around the OECD average; in science, the U.S. is above the OECD average. Results for the northeastern United States are noticeably higher than those for the South. OECD hopes to field test and market a new state version of the test for individual American states. Subsequently, the Roundtable forwarded research to OECD indicating that although 25% of Shanghai’s population is made up of migrants, that population represents only 20% of Shanghai students in Grade 1, with the proportion declining step-wise and regularly until by Grades 8 and 9 (when the PISA examinations would be administered), less than 4% of Shanghai enrollments are made up of low-income migrant students. As this newsletter went to press, only a partial response from OECD had been received.